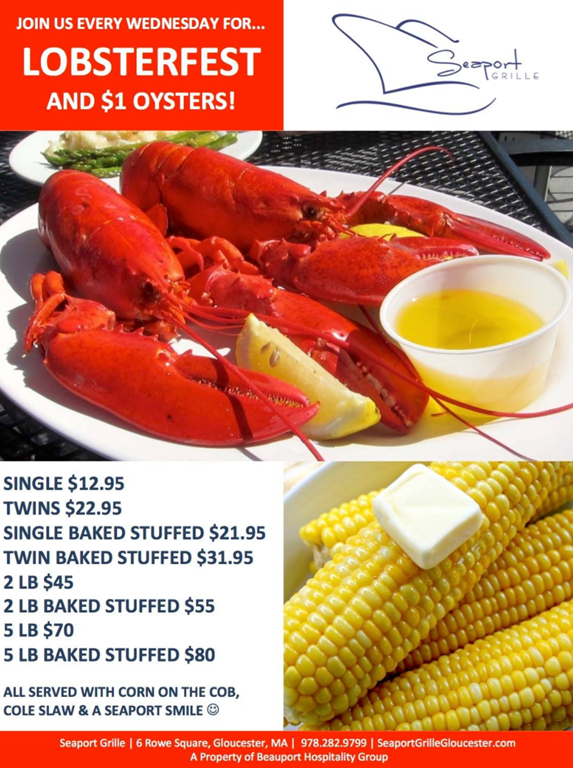 Crazy lobster specials all day long! 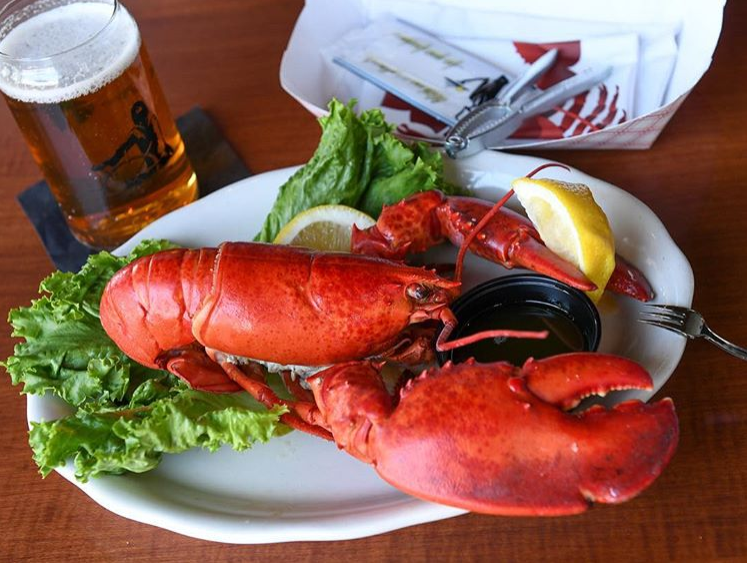 Two Lobster Lunch Cruises scheduled this week on Tuesday and Wednesday! Looking for a delicious lunch on the water? The Beauport Cruiseline leaves from the dock directly behind Seaport Grille, and has two Lobster Lunch Cruises scheduled this week on Tuesday and Wednesday! Visit www.BeauportCruiselines.com for more information and to get your tickets! seaport_grilleLobster Fest starts this week! Come by every Wednesday for our lobster specials, all served with corn on the cob and cole slaw. .
Seaport Grille friends – are you looking for something to do this Wednesday? Join us for a night of themed food and entertainment aboard the Beauport Cruiselines every Wednesday starting July 11 through August 15! Kicking off the first event of our Chefs at Sea series is Chef Jason Bond of Bondir Restaurant. Chef Jason Bond’s award-winning highly acclaimed cuisine will be brought to Gloucester where he will prepare tastes of the seasons during a charming evening 3-hour cruise of the harbor on July 11. Dine under the stars and interact with one of Boston’s most treasured chefs. Be sure to get your tickets today! Join us for a night of themed food and entertainment aboard the Beauport Cruiselines every Wednesday starting July 11 through August 15! Kicking off the first event of our “Chefs at Sea” series is Chef Jason Bond of Bondir Restaurant. About the Chef: Jason Bond (chef/owner) grew up in Wyoming and Kansas and was raised around farming and preserving the harvest. This “root cellar” style has shaped the food he prepares today. Bond moved to the East Coast in 1995 to pursue a culinary career and has worked with and learned from many passionate and idealistic chefs over the past 20 years in environments ranging from slow-smoked BBQ to Relais & Châteaux properties. Today he focuses on developing a network of food purveyors whose goals are to steward the environment and produce the best quality vegetables, fish, and meat in the world. Jason works directly with producers to find interesting vegetables and rare breeds of livestock and strives to combine traditional and modern techniques to prepare honest and flavorful food. Chef Bond opened Bondir Cambridge in November 2010. Menus at Bondir showcase the pastoral and marine bounty of our New England region and offer a finely curated selection of American and European wines and beers. Our offerings–vegetables picked the same day, fish hours out of the ocean, pasture-raised meats–will change daily, and will always be tasteful in preparation and presentation. Celebrate nine years of service to the Gloucester, MA community with Seaport Grille, North Shore Magazine’s 2017 Editor’s Choice Winner for best year-round fried clams, with three days of anniversary happenings! The team at Seaport Grille will pay thanks to the community for their continued support throughout the past nine years with specials and events on three nights the week of March 12th, 2018. To honor Seaport Grille’s very first customers “Sully” and “Scotty,” the restaurant will be hosting “Sully Day” on Tuesday, March 13, 2018 and “Scotty Cook Day” on Wednesday, March 14, 2018 where guests can enjoy Half-Priced Burgers, $9.95 Shrimp Roll, $1 Oysters, $12.95 Clam Roll and Half-Priced Lobster Pie. On Wednesday, March 14th, 2018, enjoy live music from Dave Saggs with Friends Band from 6:00-9:00PM. End the celebrations with “Customer Appreciation Day” on Thursday, March 15th, 2018, with Half-Priced Appetizers, $12.95 Lobster Rolls and live music from Brick Park Duo from 6:00PM – 9:00PM. Join Seaport Grille as they celebrate their ninth anniversary by giving back to the guests that gave to them! Reservations are highly recommended and can be made by calling 978.282.9799 or visit http://www.seaportgrillegloucester.com. “Lettuce” serve you up something tasty 😎 thank you Instagram friend @findyahome for this vibrant photo of our Lettuce Wraps! "Lettuce" serve you up something tasty 😎 thank you Instagram friend @findyahome for this vibrant photo of our Lettuce Wraps! If you come in tonight, you will be helping us support the Susan G. Komen foundation as we will be donating 20% of restaurant proceeds from each Monday night in October. LobsterFest is every Wednesday and our love of fresh seafood and fun is everyday! Join us for alfresco dining, or grab a seat at our bar and enjoy one of our world-famous signature cocktails…see you at Seaport. Join us every Wednesday at Seaport Grille for some Lobsterfest madness!